HP is looking to offload webOS on the advice of its bank, according to the latest reports which estimate the OS's price tag at 'hundreds of millions of dollars'. Reuters claims that the Bank of America Merrill Lynch has advised the tech company to palm the Palm-made OS off to try and recoup some of the money it lost on its foray into webOS tablets and smartphones. HP spent $1.2 billion on Palm last year and is unlikely to make it all back. A number of companies are said to be vying for the bargain OS, including RIM, IBM, Oracle, Intel and - wildcard - Amazon. 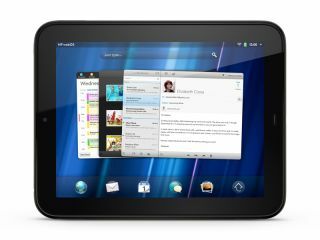 Although webOS hasn't proven massively successful on the consumer side of things, the boutique OS was a hit with critics and comes with several juicy patents. It'd be particularly interesting to see Amazon snap webOS up, perhaps a sign that it hopes to divorce itself a little from Google, whose Android OS it currently runs on its first tablet, the Kindle Fire. HP's latest comments on the matter don't give anything away, however. A spokesperson said, "We are exploring ways to optimize the webOS software." Last week, Todd Bradley, HP's VP of personal systems, said that the company is busy trying to "determine how we'll best utilise webOS and those great software assets that we have".